It is April of 2019. I am 67 years old and have thus far enjoyed a remarkable life. The overwhelming dream of my life which persisted from age 15 to age 30, was to become a concert violinist. I begged God to fulfill this dream and he did in a way I never could have imagined. At age 30 with a wife of 9 years and already 2 of our 3 children, I quit pursuing this dream realistically and entered the life insurance business with a desire to earn money. The success and wealth generated by this business enabled my wife and I to pursue art collecting, world travel and philanthropy. I continued to practice and perform as others would pursue golf, and as a result of the business career I was able to buy one of the world's great Stradivari violins and a 1742 Guarneri, del Gesù. This equipment enabled me extraordinary sound and enhanced my technique. From age 40 to 60 I worked hard and financed these 18 recordings, I am proud of the artistic level and aware of the gift and mystery of the achievement. 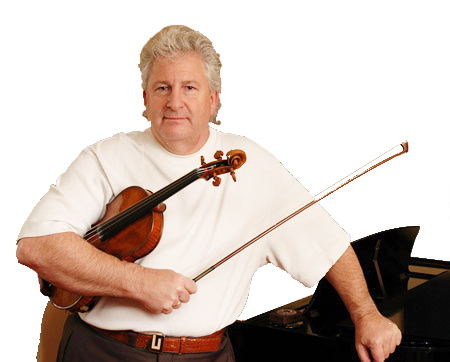 I put the violin down at age 60 because I was no longer improving and had other things to attend to in my life. The violin and music have also caused a great deal of pain because of the demands for perfection and the constant failure of meeting a nearly impossible level. It is now wonderful to be a listener, appreciating the glory of music without such critical ears. People used to always ask me, who is your favorite composer, and I could never answer. There was always a list. Today, without all the subjectivity imposed on my listening by being so on the inside, my clarity is much improved. For me it is clearly “Beethoven”. Thank you for visiting my site and I hope you enjoy the recordings.